A crowd of people made their way to Lululemon HUB on 5th Avenue in New York City on the evening of September 11 to participate in Day One of a three-day Usher syndrome event series. The cocktail gathering overflowed with wine, cheese, and spectators against the beautiful backdrop of Lululemon’s community space. Usher Syndrome Society banner near the portraits in the park. Photo by Rebecca Alexander. The event, called Rosé in the Dark, was a collaboration amongst four friends, Rebecca Alexander, Peggy Borst, and myself—all of us have Usher syndrome—and Nancy Corderman, a mother to two kids with Usher syndrome. Our objective was to bring insight to life with Usher syndrome through immersive deafblind experiences. While Usher syndrome itself is quite rare, it is the most common cause of deafblindness—the loss of both hearing and vision. In the United States, the inherited condition affects approximately four babies in every 100,000 births while worldwide, more than 400,000 people are affected with Usher syndrome. At Rosé in the Dark, we began with a three-person panel discussion. The Q&A was very personal, emotional, and informative. Following the panel, guests participated in a deafblind exercise, wearing goggles that replicate tunnel vision, a common viewpoint for a person with Usher syndrome. 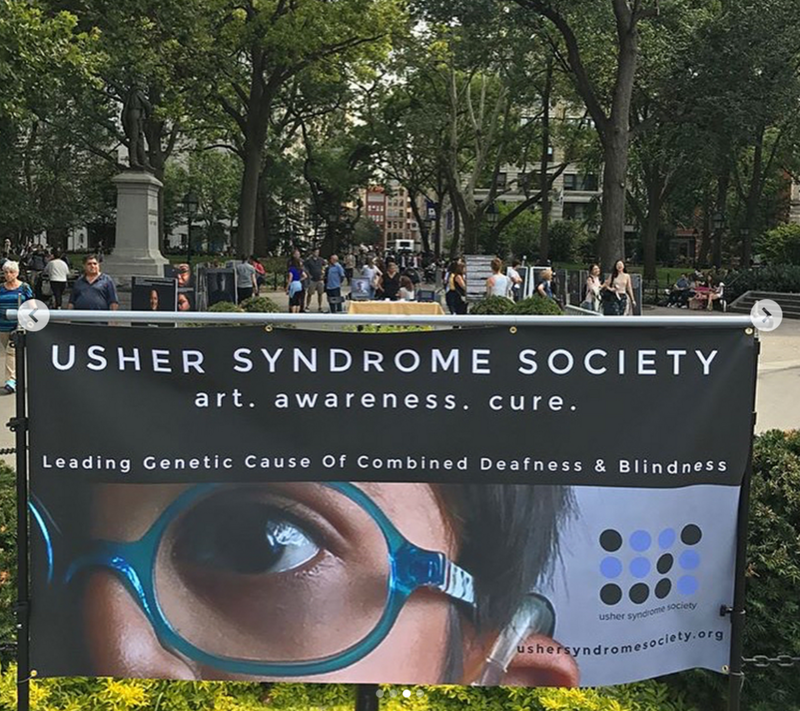 On Tuesday for Day Two, we installed a public exhibit of large portraits of people with Usher syndrome in Washington Square Park. Visitors, tourists, and students from nearby universities all absorbed personal information about these individuals while browsing through the photographs and reading their stories. For Day Three, we concluded the series with an exercise class led by Rebecca Alexander, who is also a Lululemon Ambassador. Admission to the class was donated to Usher syndrome research. As an individual with Usher syndrome, building awareness is important. Comprehending the invisible condition and knowing how to help or respond to individuals with the condition can be difficult. We will be continuing to raise awareness and create more experiences to educate everyone on ways they can help and contribute to this rare but damaging condition. Empower groundbreaking research toward better treatments and cures for Usher syndrome. If you are able, please make a contribution today.